The Energy Department announced on August 28 new investments totaling $10 million for two university-led projects to advance innovative concentrating solar power (CSP) system technologies. The five-year projects are under the Department's SunShot Initiative, a collaborative national effort to make solar energy cost competitive with other forms of energy by the end of the decade. CSP technologies use mirrors to reflect and concentrate sunlight onto receivers that collect solar energy and convert it to heat that can be used to produce electricity. 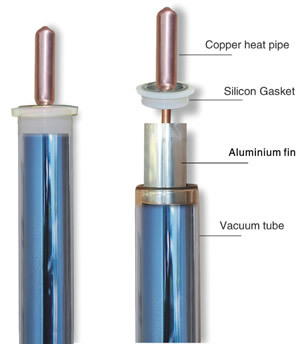 Heat transfer fluids are a key component of CSP systems that transfer heat from a receiver to the point where the heat is needed to drive a turbine. The investments will improve heat transfer fluids to increase efficiency and lower costs for CSP systems. Two university teams were selected to develop new heat transfer fluids. 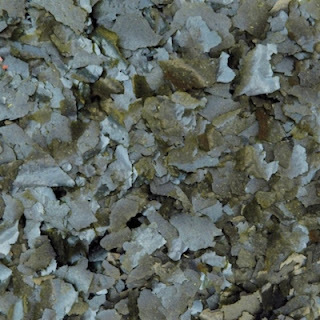 The University of California–Los Angeles will lead a team with researchers from Yale University and the University of California–Berkeley to investigate liquid metals as potential heat transfer fluids with the ability to withstand higher temperatures. And the University of Arizona, the second awardee, is teaming with researchers from Arizona State University and Georgia Tech to develop and demonstrate new, molten salt-based fluids as possible alternatives to traditional heat transfer fluids. The projects will focus on making dramatic improvements to fluids that gather thermal energy from the sun and transport it to the power block, where the energy is used to drive a turbine that generates electricity. Today's state-of the-art heat transfer fluids are capable of operating at temperatures up to about 1,050 degrees Fahrenheit. Temperatures in excess of 1,200 degrees Fahrenheit are needed to reach efficiencies greater than 50%, which allow CSP plants to capture more energy from solar power. The selected projects are working to develop heat transfer fluids that can operate at temperatures up to 2,350 degrees Fahrenheit, while simultaneously maintaining high levels of performance. See the Energy Department press release. The Energy Department on August 23 announced that a University of Maryland team has won the Department's first Max Tech and Beyond Appliance Design Competition. The student challenge, which involved nine teams, aims to inspire students to pursue energy efficiency improvements in home and commercial appliances, helping to develop innovative ultra-efficient products. The University of Maryland team chose to simplify the design of a standard wall-mounted air conditioner by separating the systems that remove humidity and provide cooling. After the students tested a fully functional prototype, they found that the design reduced energy use by 30% compared with typical wall-mounted air conditioners already on the market. 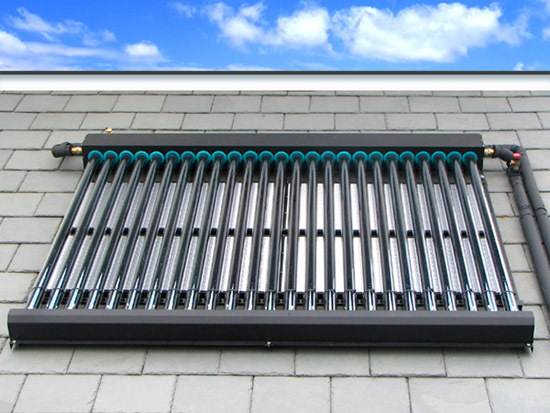 Because the current largest consumer of electricity in most homes nationwide is the air conditioning system, this innovative design has the potential to substantially decrease residential energy use and save consumers money. 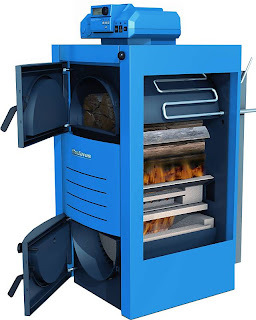 The runner-up team from Marquette University in Milwaukee, Wisconsin, developed a prototype of a natural gas-fired combination water heater and clothes dryer that can use the waste heat from the clothes dryer to heat water for the next washing load. The team demonstrated that with this approach, they could get a 10% dryer efficiency improvement compared to the best comparable products on the market. The nine faculty-led student design teams were competitively selected and funded with up to $20,000 by the Energy Department to design, build, and test their prototypes during the 2011-2012 academic year. A panel of Energy Department experts along with those from the Department's Lawrence Berkeley National Laboratory judged each team's prototype based on its demonstrated ability to reduce energy use by 10% or more compared to best on-market products, or based on the prototype's ability to reduce production costs compared with typical high efficiency products already on the market by 20% or more. See the Energy Department Progress Alert and the Max Tech website. The EPA announced on August 22 that it awarded $9 million in grants to fund 13 universities for technologies that can help predict and prepare for the impacts of extreme weather triggered by climate change may have on air and water quality. The Massachusetts Institute of Technology was awarded $749,931 to examine the ability of models to represent the presence of extreme air pollution and the weather conditions. The project at MIT, based in Cambridge, Massachusetts, will use advanced statistical techniques to identify the drivers and occurrence of historical and future extreme air quality events in the United States from observations and models. The project combines the work of statisticians and atmospheric scientists. The other 13 grants were awarded to researchers at Columbia University, Cornell University, Georgia Institute of Technology, Michigan State University, Michigan Technological University, Mississippi State University, Ohio State University, Oregon State University, University of South Florida (two grants), Public Policy Institute of California, University of Texas at Austin, and the University of Washington. See the EPA press release and the list of projects. New York Governor Andrew M. Cuomo on August 9 announced that $107 million is available for a major solar power incentive program that will increase the amount of electricity generated by photovoltaic (PV) systems throughout New York. The NY-Sun Competitive PV Program, administered by the New York State Energy Research and Development Authority, seeks proposals for PV systems greater than 50 kilowatts to be installed at larger commercial and industrial customer sites. 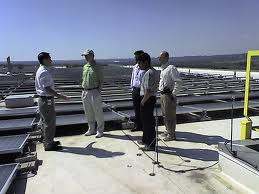 The newly established NY-Sun Competitive PV Program will make $36.4 million available in 2012 and $70.5 million in 2013. 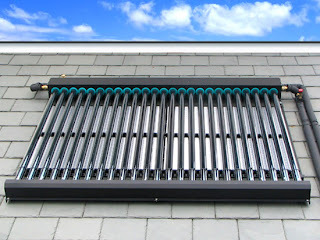 This phase of the program is available through the end of 2013 for PV projects in New York City and upstate New York at eligible customer sites. This is an expansion of a two-year-old program that previously focused on large PV systems for the commercial, industrial, and municipal sectors exclusively in New York City, Westchester County, and the lower Hudson Valley. All projects will require co-funding to best leverage state resources with funding capped at $3 million per project. 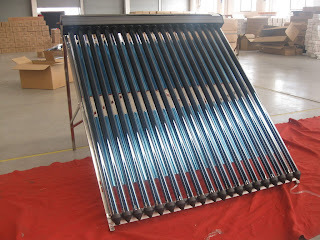 See the New York press release and the NY-Sun Competitive PV Program initiative website. The governor also signed a series of bills on August 17 as part of the NY-Sun initiative that will make solar energy more affordable for homeowners and businesses. The new laws include statewide tax credits for the lease of solar equipment and power purchase agreements, statewide sales tax exemptions for commercial solar equipment, and an extension of the real property tax abatement in New York City for solar installations. See the New York press release. Local tours of solar houses are being offered throughout the United States starting in mid-September, with most on or around October 6. The American Solar Energy Society (ASES) National Solar Tour officially takes place on October 6, but several events kick off as early as mid-September, and some offer weeklong action. Now in its seventeenth year, the annual showcase allows participants the opportunity to see innovative green homes and buildings that use solar energy, energy efficiency, and other sustainable technologies. ASES estimates that more than 165,000 participants will visit some 5,500 buildings in 3,200 communities across the United States. Kicking off the nationwide series of tours, the Michiana Solar Tour is scheduled to take place on September 15 at Goshen College in Goshen, Indiana. The following day, the BRING Home & Garden Tour bus will take ticketholders to a variety of sustainable sites in Eugene, Oregon. Most tours will take place on or around October 6, but there are events scheduled through October 27. 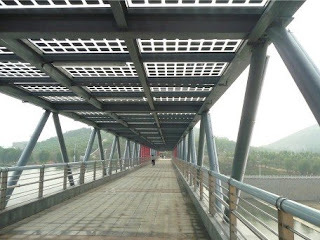 See the ASES National Solar Tour website and the list of tours. A while ago, we wrote about the quiet, rural community of Vernonia, Oregon, which had been through its share of hard economic times. After two “500-year floods” in an 11-year period devastated the area, damaging its schools and the community core, the town finally started to rebuild its school last April. More than a year later, residents of Vernonia had reason to celebrate when Former Governor Ted Kulongoski joined United States Senators Ron Wyden (D-OR) and Jeff Merkley (D-OR), and several other federal- and state-elected officials last week for the ribbon cutting of a new energy efficient K-12 school and community center. The "barn raising" mentality of the Vernonia community helped make the new school and community center a success. The energy efficiency upgrades were made possible using a combination of state, federal, private sector, and non-profit funds—paired with a $13.6 million municipal bond measure passed by the town’s voters. A $1 million grant from the Energy Department’s Energy Efficiency and Conservation Block Grant (EECBG) program helped the school district incorporate energy efficiency measures, including an energy efficient integrated heating and cooling system. This feature, along with upgrades to the building envelope and lighting, are estimated to reduce the school district’s annual energy usage by 43%—saving taxpayers more than $62,000 per year for the 135,000 square-foot school. The energy efficient upgrades provide not only a healthier learning environment for students and faculty but bolster the school district’s application for LEED Platinum designation. For the complete story, see the Energy Blog. 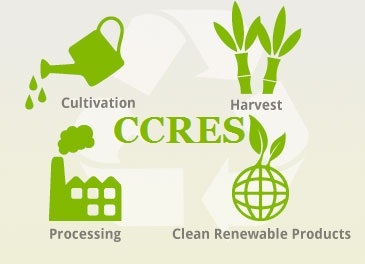 Most of the CCRES projects on small-scale renewables aim to trigger market transformation by improving conditions for suppliers and installers, and by providing easy access to good quality information for end users. Before they can be expected to buy a renewable energy system, final users must be trusted to install them property. Combination of sun and wood for producing warm water and heating for houses. 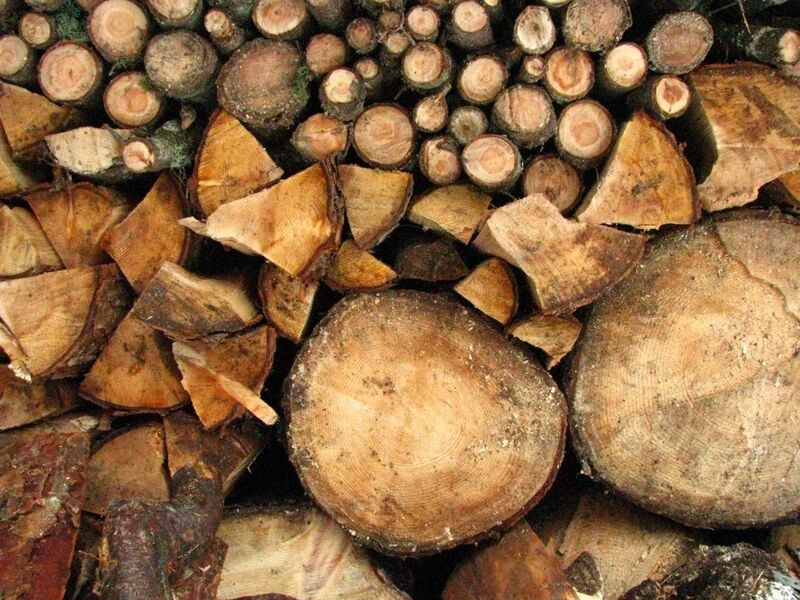 In Croatia a combination of solar panels and firewood is proving to be a promising, reliable way of heating smaller buildings and private houses. 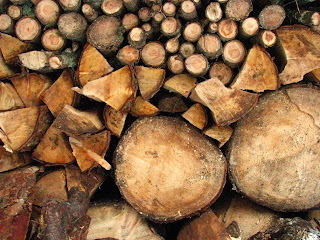 Building owners can supply themselves with warm water and heating without resorting to imports and irrespective of the price of crude oil. The CCRES SAW PROJECT aimed to bring together partners with a background in crafts from Croatia, EU and rest of the world to promote the necessary technologies. The goal of the project was the creation of training schemes, marketing, networks and public relations operations capable of being adapted to all final users in the future. If you're interested in getting involved in actions of spreading knowledge and encouraging adoption of standards that promote CCRES SAW PROJECT please send us a email on solarserdar@gmail.com. The European conference to discuss how to achieve “near zero energy buildings" (NZEB) in new construction & renovation: technologies, policies, financial instruments, definitions & national action plans, best practice examples, cost optimality of energy efficiency and renewable energy in buildings. The coming years will see a sharp increase in the market uptake of highly efficient buildings throughout Europe: by 2018, new public buildings must be "nearly zero energy buildings", by 2020, this will apply to all new buildings. According to the European Buildings Directive, a "nearly zero energy building" is a building that has a very high energy performance and the very low amount of energy required is covered to a very significant extent by renewable energy sources. Member States draw up National Plans for increasing the number of nearly zero energy buildings, covering both in new construction and renovation. an outlook on the developments on European and global markets for sustainable buildings, including "National Plans for NZEB"
Upper Austria is an ideal location for such a conference: due to consistent policies, today there are more than 1,000 buildings meeting passive building standard and several thousand near zero energy buildings. 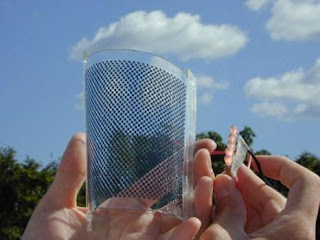 Topics for the "Call for Papers & Projects & Speakers"
Ideal for skylights, patio and deck covers. 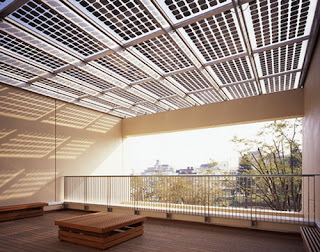 Anyplace you would like to let some light through the panels. 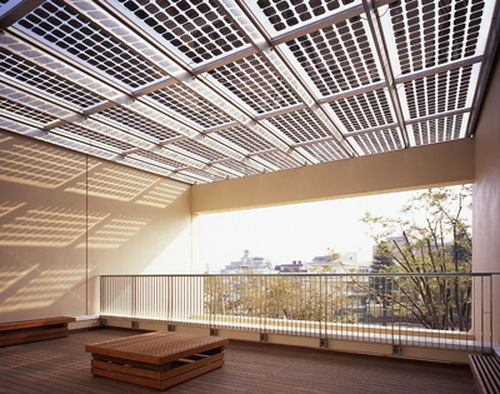 These panels can be integrated into a building so that they capture sunlight for electricity, but still allow about 15% of the light through. This provides good ambient lighting while providing some cooling by shade. These can be added on to existing or new construction, but often are best when designed in from the start of new construction. 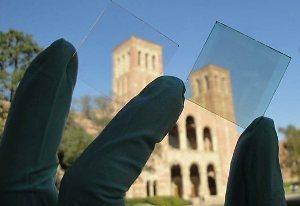 People who watch what their neighbors are doing may soon find themselves looking right through an energy-producing transparent glass solar panel, if the folks at the National Renewable Energy Laboratory are on the right track. The lab has produced a transparent photovoltaic module that is 14 times bigger than its last attempt. 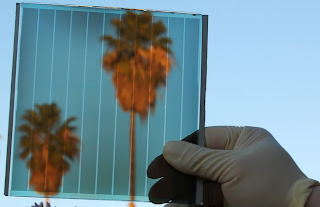 Researchers are working to capture the sun's rays more efficiently and turn them into electricity, using a see-through solar panel no thicker than a plastic grocery bag. You've seen the panels on rooftops and mirrors in the desert. 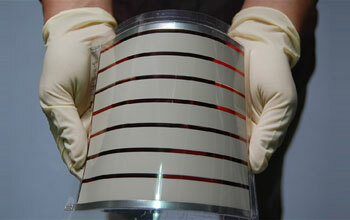 But how much do you really know about the technology needed to capture the tremendous power of the sun? Spirulina is simply the world’s most digestible natural source of high quality protein, far surpassing the protein bio availability of even beef ( which most people consider to be th e #1 source of protein ). The digestive absorption o f each gram of protein in spirulina is four times greater than the same gram of protein in beef. And since spirulina already contains three times more protein ( by weight ) to begin with, the net result is that , ounce for ounce, spirulina offers twelve times more digestible protein than beef. • People on low-carb, high-protein diets. • People who exercise vigorously or engage in strength training. • People who are frail, who have trouble gaining weight, or who are malnourished. In fact, there’s probably no better single food source on the planet than spirulina for these people. The protein found in spirulina is also a complete protein, meaning that it contains all eight essential amino acids, unlike beans, whole grains and other plant- based foods that typically lack one or more amino acids. The Obama Administration announced on August 16 the launch of a new public-private institute for manufacturing innovation. The new partnership, the National Additive Manufacturing Innovation Institute, was selected through a competitive process to receive an initial award of $30 million in federal funding, matched by $40 million from the winning consortium. The consortium includes manufacturing firms, universities, community colleges, and non-profit organizations from the Ohio-Pennsylvania-West Virginia "Tech Belt." On March 9, 2012, President Obama announced his plan to invest $1 billion to catalyze a national network of up to 15 manufacturing innovation institutes around the country that would serve as regional hubs for manufacturing. The President called on Congress to act on this proposal and create the National Network of Manufacturing Innovation. Five federal agencies—the Departments of Defense, Energy, and Commerce, the National Science Foundation, and NASA—jointly committed to invest $45 million in a pilot institute on additive manufacturing. Additive manufacturing is a process of making three-dimensional solid objects from a digital model. See the White House press release. The Energy Department on August 20 announced a new partnership between its Challenge Home program and the Passive House Institute US (PHIUS) on a voluntary certification process for energy-efficient homes. The partnership will streamline certifications for homes that can offset most or all of their utility bills with a small renewable energy system. These homes are referred to as "zero net-energy ready" homes. Home builders participating in these certification programs gain a competitive advantage in the marketplace by providing their customers with homes featuring energy savings, among other benefits. The Energy Department's Challenge Home program certifies homes that are 40% to 50% more energy efficient than typical homes. 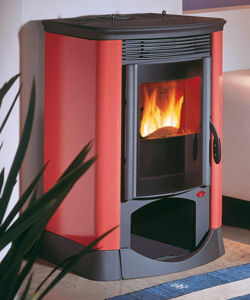 It also helps to minimize the risk of indoor air quality problems and ensures compatibility with renewable energy systems. Through the Challenge Home program and its original Builders Challenge specifications, the Department has certified more than 13,500 homes, which are saving consumers more than $10 million each year. Among these certified homes, more than 1,350 are considered zero net-energy ready homes based on Home Energy Rating System (HERS) scores of 55 or lower. PHIUS certifies building designs that are 65% to 75% more energy efficient than a typical new home, even before installing renewable energy systems. PHIUS has also trained nearly 400 construction professionals to build these homes. See the Energy Department Progress Alert. The U.S. Department of Agriculture (USDA) on August 14 announced that 106 projects in 29 states, Guam, and Puerto Rico have been selected to receive funding for the production of renewable energy and energy efficiency improvements. Funding comes through the USDA's Rural Energy for America Program (REAP). One example of a selected project is in Washington County, Iowa, where a recipient is receiving a guaranteed loan to construct a 50 kilowatt (kW) wind turbine at his agricultural business. The turbine is expected to generate approximately 103,200 kilowatt-hours (kWh) of electricity annually—enough to meet the annual requirements of nine homes. WTE-Dallmann LLC in Calumet, Wisconsin, is another recipient of a REAP grant to help fund the installation of an anaerobic digester that will generate more than 4.8 million kWh of electricity—power for about 420 homes annually. The electricity will be sold to the local utility. See the USDA press release and the complete list of projects . Ocean Power Technologies, which launched a device to convert wave energy off Hawaii's coast in 2009, plans to tap wave power off the Oregon coast. Ocean Power Technologies (OPT) announced on August 20 that its subsidiary has received approval from the U.S. Federal Energy Regulatory Commission (FERC) for a planned 1.5 megawatt wave power station off the Oregon coast. This is the first FERC license for a wave power station issued in the United States. The license provides a regulatory approval for the deployment of up to 10 OPT devices, generating enough electricity for approximately 1,000 homes. Construction of the initial 150-kilowatt device is nearing completion and is expected to be ready for deployment about 2.5 miles off the Reedsport, Oregon coast later this year. The wave energy converter consists of an open steel cylinder extending downward into the ocean from a floating buoy. A piston is located midway down the cylinder, and as waves pass, the piston moves up and down along the cylinder, applying pressure to seawater-filled hoses that eject high-pressure seawater into a turbine, which drives a generator to produce power. OPT has received funding for this first system from the Energy Department with the support of the Oregon Congressional delegation and from PNGC Power, an Oregon-based electric power cooperative. Specifically, FERC has granted a 35-year license for grid-connected wave energy production. After the initial device is deployed, OPT plans to construct up to nine additional devices and grid connection infrastructure, subject to receipt of additional funding and all necessary regulatory approvals. See the OPT press release. The popular expression "go big or go home" means to go all the way. And an energy efficiency project at a paper manufacturer in Longview, Washington, went so big that it's thought to be the largest of its kind in the United States, ever. It's so big that the energy experts at ESource, who answer thousands of energy-related questions every year, couldn’t find a reported project that's saved more energy. NORPAC is the largest newsprint and specialty paper mill in North America. 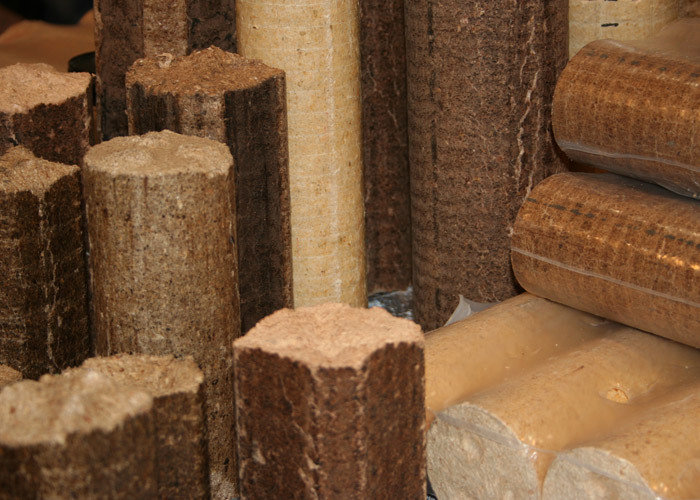 Its 33-year-old mill produces 750,000 tons of paper a year and on a daily basis makes enough paper to stretch a 30-foot-wide sheet from their Northwest mill all the way to Miami, Florida. NORPAC is the largest industrial consumer of electricity in the State of Washington, requiring about 200 average megawatts of power—roughly 100 times more power than an average household uses in an entire month. For the complete story, see the Energy Blog.